A major grant will "expand and sustain" UCSC's programs for students who are military veterans. Photo by Dave Getzschman. Veterans' programs offered by UC Santa Cruz are among the best in the country, according to the American Council on Education and the Wal-Mart Foundation, which today announced a $100,000 grant to support UCSC's programs. The campus was one of 20 institutions across the country that will receive grants as part of the ACE/Wal-Mart $2 million Success for Veterans Award Grants program. Recipients were honored for operating "model programs advancing access and success in higher education for veterans and their families." About 80 veterans are currently enrolled at UCSC, according to Corinne Miller, director of Services for Transfer and Re-Entry Students (STARS), which administers veterans' programs. STARS offers a peer-mentor program for veterans and coordinates a network of services offered by different units on campus for veterans, including admissions, financial aid, housing, and academic advising. "This grant will allow us to expand and sustain our programs," said Miller. "We're so excited." UCSC was selected out of a field of nearly 250 applications. Veterans on campus have served in all branches of the military, and UCSC is welcoming a growing number of veterans who have served in Iraq and Afghanistan, she added. UCSC's peer-mentor program for veterans was established last year with support from the Capitola Book Café, recalled Miller. A focus group made up of student veterans had identified the need for such a program, "but we really didn't have the resources to move ahead," she explained. "Then we got a phone call out of the blue from Janet Leimeister at the Book Café, who was offering to support a program for veterans," said Miller. Learning of Miller's aspirations, Leimeister organized a benefit reading at the Book Café with author Mary Tillman in June that jump-started UCSC's program. Tillman is the author of Boots on the Ground by Dusk: My Tribute to Pat Tillman, which honors her son, a former professional football player who was killed while serving as a U.S. Army Ranger in Afghanistan. "We are so grateful for that support, and this ACE/Wal-Mart grant will help us continue and expand," said Miller, noting that UCSC is collaborating with Cabrillo College to create a "seamless safety net for our veterans who begin at Cabrillo and transfer to UCSC." In addition to working with current students who are veterans, STARS serves family members of student veterans, collaborates with community agencies, and works with active service members who are preparing for college. "Everything that makes UCSC an excellent undergraduate campus is especially true for returning veterans," said Miller. "We're a smaller, world-class institution that offers tremendous support. Students can work with faculty and participate in research here. 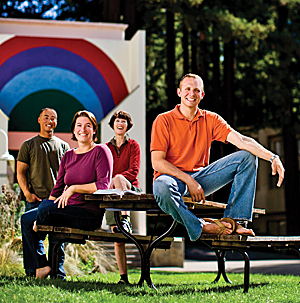 UCSC is terrific for veterans coming back and making the transition to academia." Over the past year, the Wal-Mart Foundation has awarded more than $3.6 million in grants to organizations in support of programs that provide educational assistance for veterans. "We appreciate the service and sacrifice of our nation's military men and women and our veterans, and have historically worked to address some of the special unmet needs facing the military community," said Margaret McKenna, president of the Wal-Mart Foundation. "The Wal-Mart Foundation is proud to support the American Council on Education, its colleges and universities, and many other programs that help our veterans get the resources they need to succeed in their education and their transition back to civilian life." Other grant recipients were: California State Polytechnic University, Pomona; California State University, Sacramento; Clackamas Community College (OR); Colorado State University; Empire State University, SUNY; Fairleigh Dickinson University (NJ); Fresno City College (CA); George Mason University (VA); Hunter College School of Social Work, CUNY; Lane Community College (OR); Los Angeles City College; Madison Area Technical College (WI); Onondaga Community College (NY); Park University (MO); Ramapo College (NJ); Southwestern College (CA); Trident Technical College (SC); University of Maine, Augusta; University of Maryland, University College. "Higher education is in a unique position to serve the men and women who have so bravely served our nation," said ACE President Molly Corbett Broad. "The institutions receiving these grants currently enroll nearly 25,000 veterans. When the expanded GI Bill benefits become available in August, we anticipate that these numbers will increase by approximately 20 percent, giving these institutions the opportunity to serve nearly 30,000 veterans this fall. These grants will provide needed resources to expand and enhance the work already being done on these 20 campuses, and to support the dissemination of lessons learned to other institutions. We are so grateful to the Wal-Mart Foundation for their generous support of these worthwhile projects." ACE received nearly 250 applications for Success for Veterans Award Grants, which were reviewed by a selection committee of higher education leaders, program and policy directors, and veterans. Thirty semifinalists were selected and reviewed by a panel of judges consisting of retired college and university chancellors and presidents. Selection criteria included quality and sustainability of the existing programs and initiatives, as well as strategies for disseminating best practices to other institutions. The ACE/Wal-Mart Success for Veterans Award Grants are part of ACE's Serving Those Who Serve initiative, a multi-year effort designed to effect major changes in how veterans learn about their education benefits and postsecondary options, and how institutional leaders can build capacity to serve veterans on their campuses. In addition, ACE's Serving Those Who Serve initiative includes a college planning web site and outreach campaign to inform veterans about accessing and utilizing their education benefits, and several research-based publications. ACE also hosted several regional meetings that allowed institutions to discuss concerns and pose questions about the implementation of the Post-9/11 GI Bill.